Stephens Automotive is the number one truck repair shop in the industry. We have more than 100 years of combined experience in truck repair near Arlington Heights. Stephens Automotive is a devoted full-service automotive truck service that provides outstanding truck repair services. 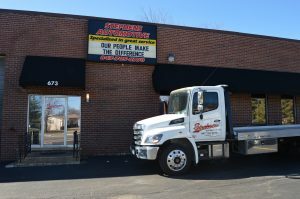 If you need truck service near the Chicagoland area, think about the professionals at Stephens Automotive. If you need a truck repair and want a truck repair shop, you can be confident with our team of ASE Certified Technicians to provide superb truck service. We promise to give you the best quality truck repair near Arlington Heights. Stephen Automotive only hires the best technicians to work at our truck repair shop. You can be assured that we will do a good job. We go above and beyond our Arlington Heights customers’ expectations. Arlington Heights is a village in Cook County, Illinois. A suburb of Chicago, it lies about 25 miles northwest of the city’s downtown with a population of approximately 75,101. At our truck shop, we offer all types of general truck repairs on every make and model. Stephens Automotive has been recognized as one of the largest providers of truck service and truck repairs. Stephens Automotive is a truck service you can count on. We have one of the most extensive facilities for automotive truck service near Arlington Heights. Stephen Automotive is the best truck repair shop in the area. We have more than 2,000 satisfied customers, and their first choice is always Stephens Automotive for truck service. Get the truck service you need from the ultimate truck repair shop. We go the extra mile for all of our Arlington Heights customers. Call Stephens Automotive at (847) 705-8770 to schedule your truck repair service today.